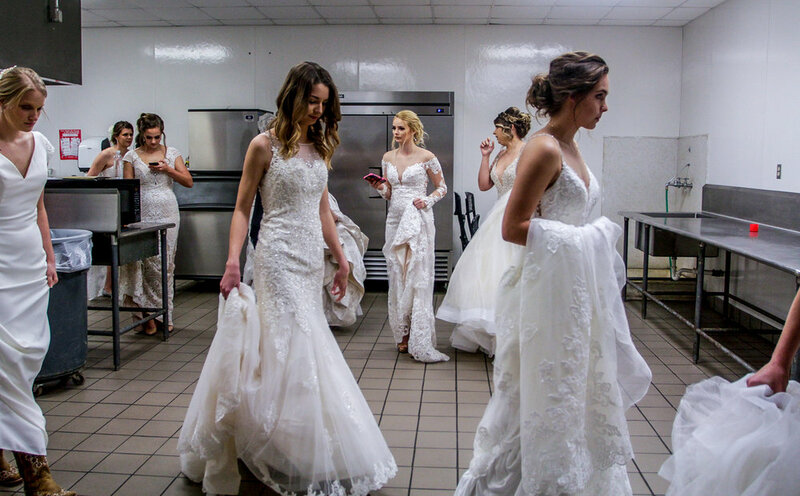 Models line up backstage in the kitchen of the Victoria Community Center before walking in the style show at the 2019 Bridal Showcase in Victoria, Texas, on Sunday, January 6, 2019. Alex Shaw, 10, enters Palace Bingo in Victoria, Texas, for the 22nd anniversary event on February 16, 2019. Alex won $700 the previous night and used his winnings to purchase a cell phone; he came back to try his luck again before returning home to Dallas with his family. Allison Leita kisses her animal during the Market Steer Judging event at the 2019 Victoria Livestock Show on March 2 in Victoria, Texas. Senior Chief Joshua Martin stands outside the gate of the U.S. Coast Guard Station Port O'Connor in Port O'Connor, Texas, while U.S. Rep. Michael Cloud speaks about the government shutdown on Jan. 21, 2019. Victoria East High School cheerleader Kendall Karnowski, 17, takes a selfie outside the gymnasium at Victoria East during halftime of the boys basketball game against Victoria West on January 5, 2019. Skip Mozisek, Crossroads Church worship pastor, watches over the congregation from backstage during the service on Sunday, February 10, 2019. Mozisek now stands here on Sundays to provide an extra set of eyes on the church entrances as an added security measure following the Sutherland Springs attack in 2017. Hector Buitrago, 64, a retiree from Colombia, South America, works at HEMI Blueberry in Farm Greensboro, Georgia, on March 24, 2018. Buitrago splits his time between retired life in Atlanta and farming in Greensboro. The sun sets over Lake Winnipesaukee Amusement Park in Chattanooga, Tennessee, on Friday, October 5, 2018. Ammishaddai Grand-Jean, Student Government Association Believe ticket president, awaits University of Georgia SGA election results at the results reading in Tate Plaza in Athens, Georgia, on March 28, 2018. A young girl plays in an inflatable at the Georgia National Fair in Perry, Georgia, on October 7, 2017. Mavis, 6, eats an ice cream cone during Athens Twilight Festival in Athens, Georgia, on April 27, 2018. A student is recognized as an honors graduate at the University of Georgia Fall 2017 commencement ceremony at Stegeman Coliseum in Athens, Georgia, on December 15, 2017.